–Quotation on the back of Sparrow’s composition for piano and violin, The Sun Shines on the People’s Square. 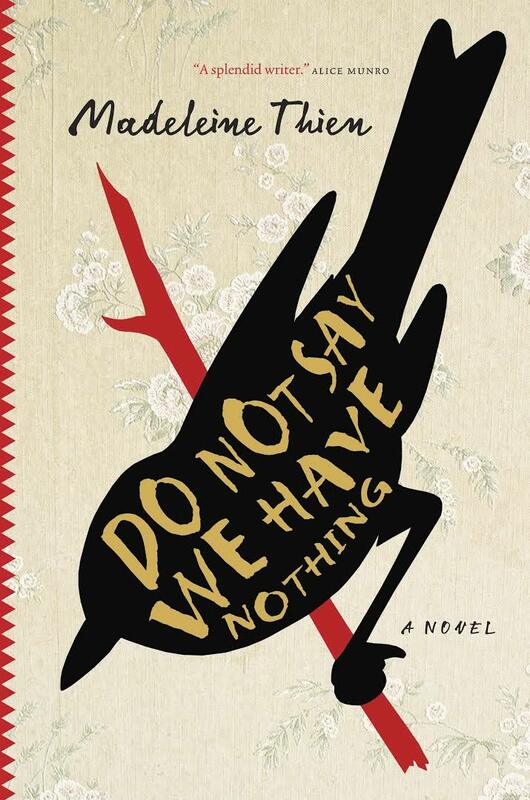 China’s Cultural Revolution and the Tiananmen Square protests and massacre form the backdrop for Madeleine Thien’s brilliant and moving novel, Do Not Say We Have Nothing, longlisted* for the 2016 Man Booker Prize and the 2016 Giller Prize. In Communist China, the government controls everything. They provide permission to marry and assign your vocation and housing. If you’re denounced as a demon capitalist for possessing counter-revolutionary propaganda (anything other than the writings of the great helmsman, Chairman Mao), you could be beaten or killed in front of your family and community as a human lesson to your comrades about the importance of Party loyalty above all else. If you’re lucky and you survive your denunciation (known as a struggle session) you get sent to the far reaches of the country to endure famine and forced labor as you reform your bourgeois ways in a re-education camp. Deep, wonderfully human characters populate this incredible novel. There’s Sparrow, the brooding composer, Zhuli the violin prodigy, Jiang Kai the orphan piano virtuoso, brash and beautifully refreshing Big Mother Knife, ethereal Wen the Dreamer, and the endearing Ba Lute, just to name a few. In addition to the beautiful humans, classical music acts as a character in Do Not Say We Have Nothing, often helping to communicate the range of emotions forbidden to good comrades as passion unbefitting a Party member. Dozens of pieces are mentioned in the book and they are so important to the narrative, I created a playlist of the music to listen to as I formed my interpretations of the novel. You’ll find it at the bottom of this post. Tiananmen Square is the “zero point” of China. It’s the “location on which all others are dependent, to which they are all related, and by which they are determined.” The zero point concept resonates throughout the book. The massacre is the “zero point” for the government — an atrocity by which the citizenry are related and determined. Each character in the novel experiences their own zero point, that moment by which their future — and their humanity — is determined. It made me consider my own zero points — the moments in my life that have formed who I am. Do Not Say We Have Nothing provokes thought in a way only great fiction can. Thien’s prose is subtle and poignant in direct contrast to the violent oppression served up by the government and the insidious and vicious acts citizens perpetrate on one another to deflect Party scrutiny. While this is a work of fiction, I’m ashamed to admit how many times Do Not Say We Have Nothing had me Googling dates and key figures in the Chinese Cultural Revolution. Bearing witness and memory is a centrally important theme by which the book gets its name. In attempting to move on with his life, composer Sparrow says, “If I forget, what’s left? There’s nothing.” To have nothing is to forget. To forget is to dishonour those who’ve sacrificed their lives as victims of government oppression. Read this book, educate yourself, and above all remember what happened in Tiananmen Square and to the victims of communist oppression so that you cannot say we have nothing. * 10/10/16 Update: Do Not Say We Have Nothing made the 2016 shortlist for the Governor General’s Literary Award. This Spotify playlist — at 25 hours long — is as complete as I can make it — the one notable exclusion is Stokowski’s transcription of Bach’s Chorale Preludes. I wasn’t able to find them on Spotify. Enjoy!